The incidence of chronic wounds, such as diabetic foot ulcers, pressure ulcers, venous leg ulcers, and surgical wounds, and other chronic wounds, is increasing at an extremely high pace, globally. Diabetic foot ulcers, are most common chronic wounds in patients suffering from diabetes, and lack of proper treatment of the foot ulcers often lead to progression of the wound resulting in lower extremity / foot amputation. Pressure ulcers are often a cause of lack of movement of the patients, longer hospital stays, and rising geriatric population leading to increasing prevalence of chronic diseases requiring increasing number of hospital admissions. The increasing incidence of these chronic wounds, has been exerting huge cost burden on the healthcare systems around the world, including direct costs due to treatment, hospitalizations, and nursing costs, along with indirect costs due to lack of productivity and loss of working days. Various agencies, and government bodies around the world, have taken initiatives, set up treatment and prevention guidelines for the control of increasing incidence of chronic wounds and reducing the cost burden. The global diabetic foot ulcers and pressure ulcers market stood at US$2.8 bn in 2015. Rising at a CAGR of 6.6% between 2016 and 2024, the market is forecast to reach US$4.9 bn by the end of 2024. The global diabetic foot ulcers & pressure ulcers market is segmented on the basis of type of wound, treatment type, and end users. Among the type of wound segment, the diabetic foot ulcers accounted for the largest share of the global diabetic foot ulcers & pressure ulcers market in 2015, and is expected to continue the dominance during the forecast period. The increasing incidence of diabetes, rising risk of diabetic foot ulcers in the diabetic population, and lack of preventive measures, are some major factors responsible for high growth of the diabetic foot ulcers segment in the global diabetic foot ulcers & pressure ulcers market during 2016-2024. Among the treatment type segment, the wound care dressings segment accounted for the largest share of the global diabetic foot ulcers and pressure ulcers market in 2015. Among the key end users, including hospital inpatients settings, hospital outpatient settings, community health centers, home healthcare, and others, hospital inpatient settings constituted the leading segment in 2015. It held over 36% of the market and is forecast to remain dominant through the course of the report’s forecast period. 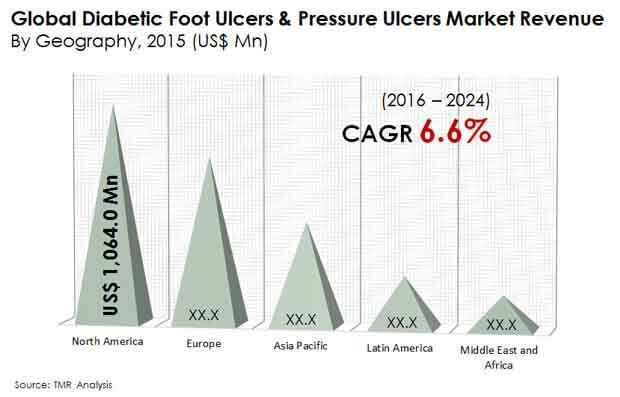 Regionally, the diabetic foot ulcers & pressure ulcers market has been segmented as North America, Europe, Asia-Pacific and Latin America and Middle East & Africa. North America accounted for the largest share of 38.1% in the global diabetic foot ulcers & pressure ulcers market in 2015, followed by Europe. The increasing incidence of diabetic foot and pressure ulcers, owing to factors such as higher percentage of geriatric population, higher life expectancy in sub-regions of Europe, increasing number of hospital admissions and surgical procedures performed in Europe and North America, along with rising risk of hospital acquired pressure ulcers, are expected to drive the growth of the diabetic foot ulcers and pressure ulcers market in these regions. However Asia Pacific is expected to register highest CAGR in the global diabetic foot ulcers and pressure ulcers market during forecast period. Major players having presence in the global diabetic foot ulcers & pressure ulcers market include 3M Healthcare, Smith & Nephew Plc., Acelity L.P. Inc., ConvaTec, Inc., Molnlycke Health Care AB, Coloplast A/S, Medtronic Plc, B. Braun Melsungen AG, Organogenesis, Inc., Medline Industries, Inc., and BSN Medical GMBH, among others. Diabetic Foot Ulcers and Pressure Ulcers are types of chronic wounds, affecting millions of people around the world. The prevalence of diabetes is rising at a high rate, and various studies and statistics state that around 15% of people suffering from diabetes are at a risk of diabetic foot ulcers, once in their lifetime. Also 24% of diabetic foot ulcers usually progress to a stage requiring amputation of the leg / foot. Pressure ulcers are most common cause of hospitalization and longer hospital stays, reducing the mobility of the patients. Incidences of hospital acquired pressure ulcers, and medical devices acquired pressure ulcers are increasing at an alarming rate. These factors in combination with other factors such as increasing prevalence of chronic diseases, such as Cancer, HIV, peripheral artery and vascular diseases, rising percentage of geriatric population, obesity and other conditions, are responsible for the high growth of the global diabetic foot ulcers and pressure ulcers market in 2015. The market overview section of the report comprises qualitative analysis of the overall diabetic foot ulcers and pressure ulcers market considering the factors determining the market dynamics such as drivers, restraints and opportunities, along with Porter’s five force analysis and market attractiveness analysis. In addition, such as market opportunity analysis for type of wound, treatment types, and end users, and key industry developments has also been provided. Key industry developments include the major events occurred in past decade and are expected to occur during the forecast period which are likely to affect the market dynamics. The global diabetic foot ulcers and pressure ulcers market has been segmented on the basis of type of wound, treatment type, and end users. On the basis of type of wound, the global diabetic foot ulcers and pressure ulcers market is categorized as diabetic foot ulcers (grade 0, grade 1, grade 2, grade 3, grade 4, and grade 5), and pressure ulcers (stage 1, stage 2, stage 3, stage 4). Moreover, on the basis of treatment type, the global diabetic foot ulcers and pressure ulcers market has been segmented into wound care dressings, bio-actives and wound care devices. Furthermore, on the basis of end users, the global diabetic foot ulcers and pressure ulcers market has been classified as hospital inpatient settings, hospital outpatient settings, community health centers, home healthcare, and others. The market for these types of wounds, treatment types and end users has been extensively analyzed on the basis of factors such as usage pattern, sales revenue, geographic presence and technological developments. The market size and forecast in terms of revenue (USD million) for each of these segments have been provided for the period 2014 to 2024, considering 2015 as the base year. The report also provides the compounded annual growth rate (CAGR) for each segment for the forecast period 2016 to 2024. Geographically, the diabetic foot ulcers and pressure ulcers market has been classified into five segments namely; North America, Europe, Asia-Pacific, Latin America, and the Middle East & Africa. The market size and forecast for each region has been provided for the period 2014 to 2024, in terms of type of wound, treatment type and applications, along with the CAGR (%) for the forecast period 2016 to 2024. The report also provides a section on the competitive landscape, wherein the market share analysis of leading players in the global diabetic foot ulcers and pressure ulcers market, in terms of percentage share in 2015 has been discussed. A list of recommendations has also been included for new entrants as well as existing market players to help them establish a strong presence in the market and increase their market share. The report concludes with the profiles of major players in the global diabetic foot ulcers and pressure ulcers market such as 3M Healthcare, Smith & Nephew Plc., Acelity L.P. Inc., ConvaTec, Inc., Molnlycke Health Care AB, Coloplast A/S, Medtronic Plc, B. Braun Melsungen AG, Organogenesis, Inc., Medline Industries, Inc., and BSN Medical GMBH, among others. The major market players are evaluated on various parameters such as company overview, financial overview, product portfolio, business strategies and recent developments.